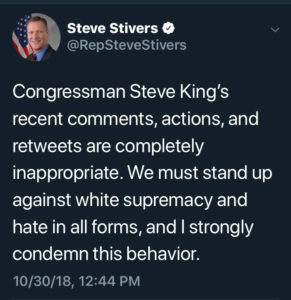 The chairman of the National Republican Congressional Committee has taken to Twitter to chastise Iowa Republican Congressman Steve King. King has responded by saying the attack is “orchestrated” by those who seek to impeach the president. Steve Stivers is the Ohio congressman who leads the committee directing campaign cash and resources to other Republicans seeking re-election to the U.S House. 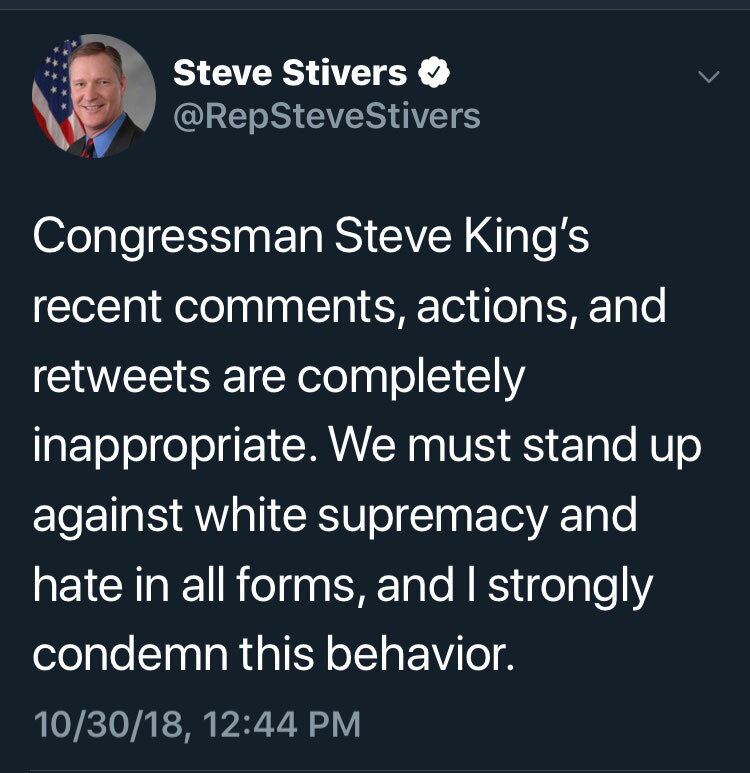 Stivers posted a comment about King on Twitter, saying King’s “recent comments, actions, and retweets are completely inappropriate.” Congressman Stivers said the country “must stand up against white supremacy and hate in all forms” and he “strongly” condemned King’s behavior. King’s Democratic opponent, J.D. Scholten of Sioux City, last week challenged “at least one Republican elected official to condemn” King’s recent behavior. Scholten tweeted his respect to Congressman Stivers and added the hashtag #CountryOverParty. Fred Hubbell, the Democratic candidate for governor, this afternoon called on Republican Governor Kim Reynolds to remove King as co-chair of her campaign. King has recently retweeted an internal poll showing him leading Scholten by double-digits, while Scholten has retweeted a poll showing the race essentially tied. The Cook Political Report has recently moved the race from a “likely Republican” to a “leans Republican” rating. Scholten’s full statement: “When you run for Congress, or when you’re elected to Congress, you become a leader and you have a platform. You get to decide how you use your platform. For 15 months, my campaign has used ours to talk about health care, infrastructure, our agriculture economy, getting big money out of politics, and more. “Steve King could be using his platform to promote things to help this district, yet, he’s abdicated his leadership to push his own personal agenda and support white nationalists and neo-nazis. He doesn’t do town halls or publicly scheduled events, and he refuses to debate me. Instead, he uses his platform to spread fear and division at the expense of our district. “Last week I issued a challenge for at least one Republican elected official to condemn Steve King’s recent behavior. I applaud Rep. Steve Stivers, Chair of the National Republican Congressional Committee for his comments today. We need more representatives willing to put country over party. Fred Hubbell, the Democratic candidate for governor, issued a statement as well.